I got there as the sun was rising (right in my face) and was all alone for ages, quite happy in my own little world of running euphoria and a mental shopping list. Someone came up right behind me and the next thing I saw were the soles of her trainers flashing away from me. My expletive and theatrical gasp were enough to elicit a ‘sorry!’ from her as she disappeared over the horizon. ‘Are you ok?” . I wasn’t really ok, I mean I was ‘OK’, but the running tourettes had set in and my GPS was getting it in the neck for not calling the kilometres fast enough. She went on to lap me, literally completing 2 laps to my one. I looked at her running technique and duly noted how she kept her hips forward facing (mine tend to salsa) and quite low to the ground. Hmm, I thought, I might try a bit of that. Eventually the torture was ended as 11km was finally announced by the nice lady on my GPS. I walked and stretched a bit as the stealth missile continued her laps, at the same pace (bloody fast). I tried a sports drink during and at the end of the run. I did the whole 25 minute yoga session when I got home. I was careful to keep hydrating for the rest of the day to the point where I thought I would drown. 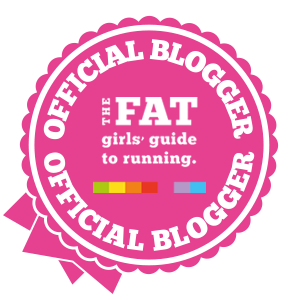 This week’s challenge from ‘the fat girls guide to running‘ was to run with someone. My nemesis. I have never wanted to run with anyone. I like going when I want, at the pace I want and where I want. I’m also slightly self conscious about my conversations with my GPS. And a little ashamed of the abuse she sometimes gets when she doesent call the kilometres as fast as I think she should. But the universe was with me and as luck would have it my wee running friend Karen Mackay came on holiday this week. She even bought me a super, amazing present – sucky-in-tights especially for running! I have read that these compression tights help recovery. I am quids in now – running tracks, yoga, sports drinks, excellent nutrition. I’ll wake up Kenyan tomorrow. 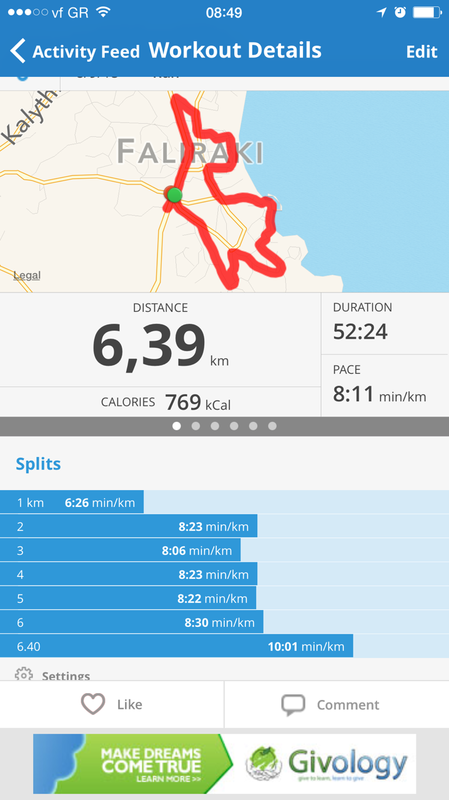 A six minute kilometre? SLOW DOWN, Karen Mackay! Karen is training for a 10k so she was keen to run regularly during her holiday (yes, you read that correctly). We’ve both been running for about 18 months, Karen with Jog Scotland and me on me jack jones. She repeatedly gives me little jewels of information and advice which I either take on (power walk if you can’t run) or reject (hill’s are your friends. Really. In what parallel universe?) So she was keen to join me on my training runs and even agreed to join me on this weeks long run of 13k. I reciprocated her kindness by making her run our long run on the track. What are best friends for if not 33 circuits in 40 degrees with the sun in your face? She returned this kindness by insisting that we do it at 6am. Off we went into the sunrise and onto the track. Karen is a great motivator whilst running. She sets a good pace and keeps me going. But after completing just 1 lap of 400 metres this little grumpy face all the way from Inverness politely enquires ‘is that a kilometre yet?’ Her frown deepens when I tell her ‘not yet’. Oh dear, this may not end well. Or it may end really soon. I know what’s she’s feeling. Chronic boredom and the prospect of continuing for another 33 circuits in that emotion is not a good one. I inject some excitement into the route by changing direction every 3 kilometres which means 4 lots of directions. I know how to party. Whatever the maths or the psycology, we did it. And the best thing about running with someone? They might just make you run faster than you think you can. And even make 33 laps of track bearable. Maybe I could give this ‘running buddy’ thing a go. Who’s coming?